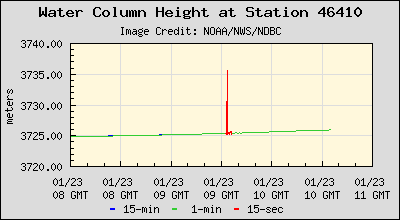 The Big Wobble: Phantom tsunami: Alaska buoy at station 46410 sent data to the mainland showing a massive 35ft (10 meters) spike in water and a wave that never was! Phantom tsunami: Alaska buoy at station 46410 sent data to the mainland showing a massive 35ft (10 meters) spike in water and a wave that never was! The case of the phantom tsunami: Why did an Alaska buoy show a big wave that wasn’t there? in the moments just after the powerful 7.9 Alaskan quake, a small buoy out in the Gulf of Alaska caused panic among officials. I even downloaded a screen grab my self, see above. Immediately sirens were turned on all along the Gulf of Alaska rudely waking thousands of shocked Alaskan's who were warned to evacuate at least 100 metres onto higher ground who not surprisingly were expecting a massive tsunami wave. According to Anchorage Daily News, here's what happened, as Hale explains it: That station is about 30 miles from the epicentre. The sudden spike in water displacement so soon after the quake probably reflected the burst of seismic energy released, not a wave. The buoy receives the pressure readings and sends them via satellite to tsunami centres and the National Data Buoy Center. Rather than producing a Japanese type tsunami, the quake produced nothing more than a burp! I'm in Florida, and I didn't hear that.